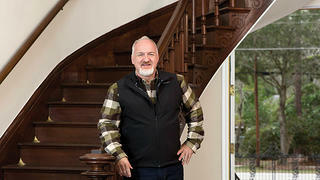 Art Smith in front of the house’s original mahogany staircase. 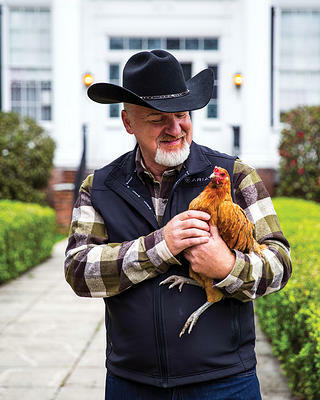 Chef Art Smith has an impressive culinary resume: former personal chef to Oprah Winfrey, James Beard award–winning cookbook author, cofounder of food education nonprofit Common Threads, and Top Chef Masters contestant. He’s also a preservationist. One of his seven restaurants occupies a 19th-century Chicago carriage house, and later this year he’ll open a new venture in New York’s historic Grand Central Terminal. We recently chatted with Smith about another of his latest projects, Reunion Florida Garden and Kitchen School. Slated to open this fall, the innovative culinary education center is based in the Wardlaw-Smith House, built in the 1850s in Madison, Florida near Smith’s hometown of Jasper. The portico will welcome culinary students this fall. Why did you decide to locate the school in a historic building? 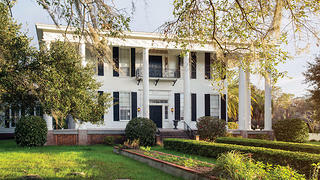 The Wardlaw-Smith House is one of the finest examples of antebellum architecture in this region. The idea [was] that it would be my special place to teach people the importance of the sustainability of food, from the growing of it to the preparation. As it evolved, I felt that this place would become an incubator of knowledge. What work have you done to the house? The house was restored over 30 years ago and it’s been kept up. I just repainted it, repaired some damage after a hurricane last year, and converted the detached shed into a cafe. Probably the most significant change is the kitchen [also detached]. I hired these amazing kitchen designers from England who went into the house and studied the moldings and took pictures, so the kitchen furniture they created looks very reflective of the house. How do you hope to engage the local community with Reunion? The idea is that people would actually use the house, that it could be something that functions. For me, my work at Wardlaw-Smith House is my way of giving back and using Reunion as a catalyst to bring education to the community. But in a very modern way, through modern education. What is the connection between food and historic places? Everybody wants to eat food in a pretty place, and the fact is, food is not very interesting without a story. When rooms have a certain patina to them, a certain feel to them when people walk in—just the scale and everything—it all lends to the experience. Food just tastes better when it’s in a beautiful old house or a beautiful old storefront. Smith with a resident of the property.